Let’s have a look at Sea Kayaking tours in the Coromandel area. Cathedral Cove Kayaks are extremely stable where children are permitted to safely enjoy kayaking with adult paddling right behind them. Now, here’s what you may not know. 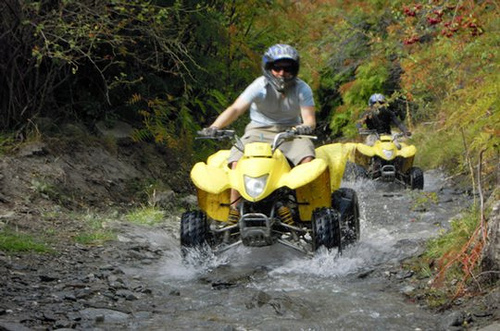 There are actually rafting tours in New Zealand designed especially for children. Recently, we came up with a great option for a family of six staying in Queenstown. The adults wanted to do a wine tour – understandably the kids rebelled. So the adults got their wine tour and the kids went on a 4-wheel trike adventure tour. One adult from the party chose to go with the children to supervise. However if your kids are old enough, you can sign a waiver and put them under the care of the trike guide. Better still, the whole family can spend some bonding time by doing it together. For a bit of magic, the Hobbiton- Lord of the Rings Tour near Matamata (North Island) combines fantasy with scenic beauty. You’ll quickly find out why these locations are so popular with overseas filmmakers. The Hobbiton Movie Set has become an iconic tourist attraction in New Zealand. You will need to plan this well in advance. Another very cool and more personalised Hobbiton film set option is ‘Hairy Feet Tours’ near Waitomo. This small group tour is so relaxing and in some ways, more interesting. Now most kids love a farm tour! 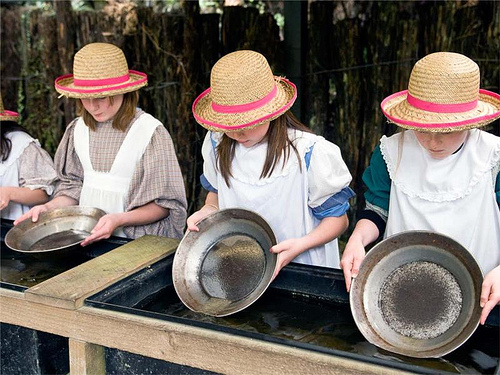 In New Zealand we have farm station tours where both children and adults) experience a working farm. This includes the delightful interaction with domestic animals. Everyone loves feeding baby lambs and bambis (small deer). And an absolute highlight would have to be seeking a working dog in action. We’ve seen this many times and never get tired of it Having done it myself, I thoroughly recommend the Walter Peak Farm Tour across from Queenstown. Would you mind if your children got to meet this big guy? Think by having kids, you’ve struck gold? Hmm, you must be thinking about gold panning. There are a few places you can do this, but Central Otago and Shantytown near Greymouth, are two of them. This is an extremely safe activity in a controlled environment. The local guides have lived in the area mostly all their lives. They have the ‘inside’ knowledge and perhaps more important, they make it fun. 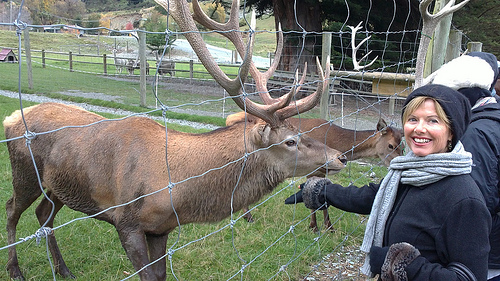 When travelling New Zealand with children, a cultural experience can be enriching. So how about exploring your child’s creative edge with Maori Flaxweaving. Under expert guidance they’ll create something precious to take back home to show their friends. If you’re looking for something relating to nature and New Zealand conservation, how about an Eco-Tour near Wanaka. On this tour, you’ll explore the untouched paradise that is Waho Island. Everyone is given the opportunity to plant their very own tree here. How special is that! Happy Travelling New Zealand with Children & Adults!